Have you heard of the technology Chromoting? 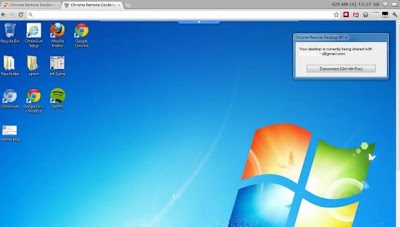 For just as from now you will begin to hear about it thanks to this technology was first used for the extension Chrome Remote Desktop by allowing access from one computer to another via the browser chrome. The basic idea is that you can control a computer remotely from another computer safely. This extension must be installed on both computers, the computer being shared session that generates the code that will need introcirse from the remote computer seeking access to it, allowing the remote computer from a complete control system safely. The extension is cross-platform, being able to use both Windows, Linux, Mac OS X and Chromebook and is made in beta in order to demonstrate the core technology Remoting Chrome and get feedback from users. As a further point, this extension uses the Google Talk technology for sending messages, so both of you share a session in the system where sharing is installed and also allows communication between users.